NY Book Editors. A Guide to Writing Your Novel in One Year. Takeaway – I love the 365 Day Book Writing Challenge. If you’re really struggling with getting into (or back into) the writing seat, this will get 66,795 words on the page in a year. Bonus – if you write this slowly, you can edit as you go. A link from this page is ‘How to Balance Your Day Job With Your Writing Passion’. I need to visit this one because my day job is overwhelming right now (which is why I sit here at 4 a.m. writing this post). Word Counter. 365 Day First book Writing Challenge. This is the link from the above book challenge. One of these rules is to not go to bed until you’ve crossed off your word count for the day. This word count is easier to cross off than the NaNo word count of 1,667. Inklyo. How to Write a Novel in Just One Year. This one is more prescriptive. It sets a schedule for the process. Month 1 – Outline. Month 1-3 – research. Etcetera. 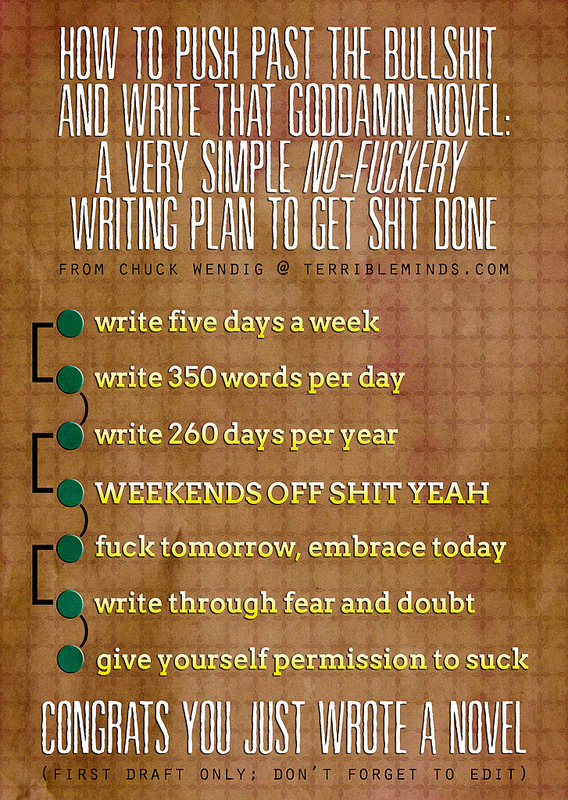 For someone who needs a set schedule to accomplish writing a novel, this looks pretty good. This is a nice infographic for the bulletin board. Beware – it’s novel writing software so the free resources on this site are somewhat limited. And before parting, Writer’s Digest’s 7 Things That Will Doom Your Novel. Obviously, this is tongue-in-cheek. It gives the what-not-to-do, then counters with ideas of what to do to get over the negative. I like ‘The Page-Long Sentence’: “Choose something to describe (a room or a character) and write a page-long sentence about it, not pausing to edit and instead going on whatever tangents present themselves.” I’d like to try this to see if I can write one sentence that stretches the length of an entire page. This entry was posted in Beginnings and Endings, Brainstorming, Creativity, Motivation, writer's block, writing goals and tagged Write Your Novel In A Year. Bookmark the permalink. I missed my February slot with my editor. She rescheduled me for May, and if the book (which currently sits at 100 pages/25K words) isn’t drafted by then, it absolutely won’t get released in 2019. Which means the box set won’t, either. Which pretty much destroys my attempt at a marketing plan. Most of these are too slow for my needs (65K in the next 3 and 1/2 months), but i really like the long sentence idea. The next time I’m stuck, I’ll try that out. I rooting for you to get your book and your box set done. I bought The Demon’s in the Details the day it came out but I haven’t had the chance to read it. I’m too busy and I want to wait until I have uninterrupted time. Can’t wait for the next one, too.